The new restaurant within an Oakland nightclub serves homey Puerto Rican fare — and plenty of deep-fried bar food. 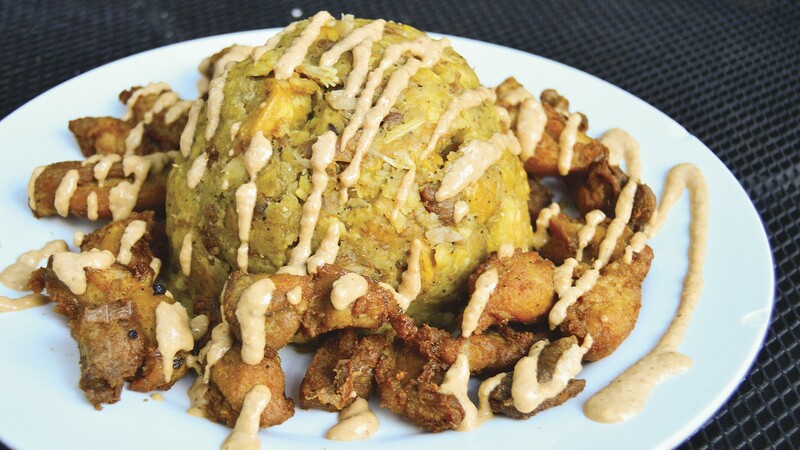 Mofongo with crispy, fatty chicken chicharrones. For six years, Borinquen Soul was the East Bay's only spot to feast on Puerto Rican food. It started as a food truck, migrated to a tiny takeout joint within a liquor store, and unceremoniously closed in November. Fortunately, it's not because Oakland lacked an appetite for Puerto Rican food. Borinquen Soul owner Eric Rivera actually had just taken over the kitchen at Brix 581, a bar and nightclub in the Jack London area. He calls his new venture W.E.P.A! at Brix 581. "Wepa!" is a Puerto Rican exclamation that means something along the lines of "Congratulations!" or "All right!" Turning it into an acronym, "Where Everybody Parties At," came to him in his sleep — Rivera wrote it down in the morning and never looked back. 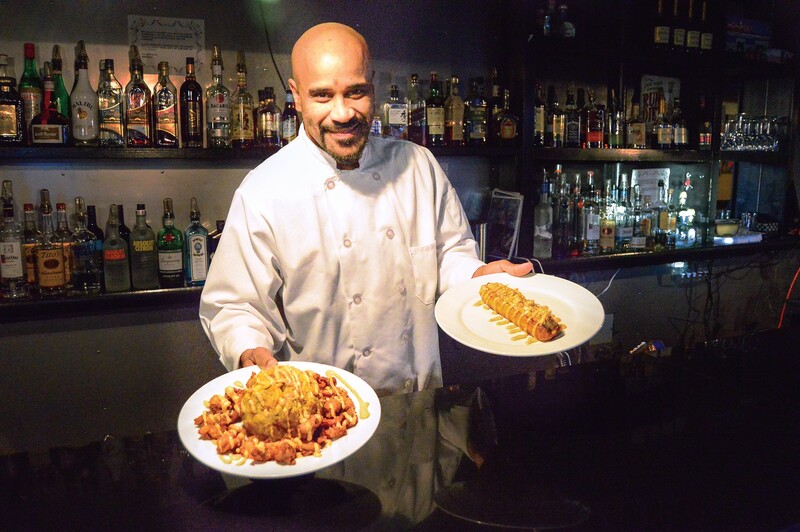 With W.E.P.A!, Rivera is able to bring his Puerto Rican dining experience up a notch. It's a no-frills, somewhat dark space, but there's table service, a full bar, a sound system, and a slightly bigger kitchen — all exciting developments. Plus, Brix 581 owner Adam Afuvai is one of Rivera's childhood buddies. They've been planning to collaborate since Borinquen Soul's food truck days. At first, Rivera hoped to keep both establishments up and running, but it became too much to handle on his own. Customer complaints mounted at Borinquen Soul. The final straw was when one of his managers decided to launch Taco Tuesdays. "I just lost it," River said. "Where in 'Taco Tuesdays' does it say 'Puerto Rico?'" With a nod toward the beer on tap, Rivera created a bar menu, which is available during regular dinner service as well as late at night. The most exciting new item is the canoas ("canoes" in Spanish): caramelized plantains split lengthwise and stuffed with meat and melted cheese. With a final squiggle of mayuketchu, a mayo-based sauce spiked with chili and garlic, the soft, sweet-savory dish feels perfect for booze-fueled grubbing. I was less enamored with the jibarito, a Puerto Rican sandwich with tostones (fried green plantains) in place of bread. The main issue was that the tostones were too dry. The filling of shredded chicken, cheese, and an odd broccoli stem was flavorful enough, but I wished the garlicky plantain coins had more time to crisp up in the fryer. Unsurprisingly, the bar menu is heavy on the fried items. I enjoyed the bacalaitos, pancake-like codfish fritters, which arrived appropriately golden-brown with a dense but mellow interior. Even better were the shatteringly crispy, deep-fried empanadas filled with chicken and gooey cheese. The ground beef version, however, leaked about a tablespoon of oil onto the plate as I picked it up, and tasted just as greasy. It can take months for a restaurant to fully dial in its consistency, and W.E.P.A! still needs a little work in that department. In addition to the discrepancy in the empanadas, the chicken chicharrones provided two radically different experiences on two separate nights. The first time, they were small, brittle, and forgettable. Two weeks later, they were succulent, substantial chunks encompassing skin, fat, and thigh meat. You can order those chicharrones à la carte or with mofongo, a giant mound of mashed tostones, for a beast of a filling meal. For a solo eater, though, all of W.E.P.A! 's dinner plates should be more than enough food, and I'd find it hard to pass on one of the combos that comes with rice and plantains. That's because the sweet maduros were so perfectly custardy and the annatto oil-hued arroz con gandules so aromatic with sofrito, the garlic, onion, cilantro, and pepper sauce integral to Puerto Rican flavor. The chuletas fritas, a beautifully bronzed, deep-fried pork chop, was particularly juicy and tempting. One Borinquen Soul favorite you won't find at W.E.P.A! is the pasteles, the Puerto Rican version of tamales. Rivera said he's had trouble finding white cocoyams, the root vegetable he subs in for masa, but that pasteles should return within the next month or so. He's also looking to add lunch, link up with a delivery service, and expand W.E.P.A! 's vegan and vegetarian options. Considering the meat-centric nature of Puerto Rican cuisine, he's already doing well in that department. In addition to plantains, arroz con gandules, and a simple salad, Rivera makes veggie versions of his empanadas, jibaritos, and canoas with a mix of carrots, broccoli, peas, and corn. Chef-owner Eric Rivera makes prime bar food at W.E.P.A! The only other area where W.E.P.A! needs work is in its communication with potential diners. For now, there's no website, although Rivera said it's coming. Up until last week, there wasn't a phone, either. To find out W.E.P.A! 's schedule, you need to go to Brix 581's Facebook page — and that's actually more important than it ought to be, as sometimes the nightclub hosts an event that charges a cover. I showed up one Sunday at 7 p.m. for dinner to find a bouncer collecting $5 for an all-day dance party. For our four-person group, a $20 surcharge just to eat seemed ridiculous, so we went elsewhere. Rivera admitted there have been some kinks but maintained that diners should never run into such issues during their established dinner service, which is Wednesday through Saturday from 5 to 10 p.m. And if there is a problem, folks should ask to speak to a manager. Sure, the new setup isn't as straightforward as Borinquen Soul's old takeout counter at Two Star Market, but Rivera sounds ecstatic regardless. Hours: dinner Wed.–Sat. 5–10 p.m.; bar menu Fri.–Sat. 10–1 a.m., Sun. 3–9 p.m.